This function allows users to view and process successful incoming SPS 850 messages. These messages are loaded into SAP Business One as open Sales Orders. The user will have the option to approve or reject Sales Orders with Acknowledgement or manually process Sales Orders with no Acknowledgement. See Processing Sales Orders for more information on processing open Sales Orders. Sales Order selection can be filtered by Customer Number (see marker 1 below), Posting Date range (see marker 2 below), Status (see marker 3 below) and Due Date range (see marker 4 below). Open Sales Orders can be filtered by Customer Number (1), Posting Date (2), Status (3) or Due Date (4). Use this search field to filter by Posting Date range. Start date of the Sales Order Posting Date range filter. Use this search field to filter by Posting Date range. End date of the Sales Order Posting Date range filter. 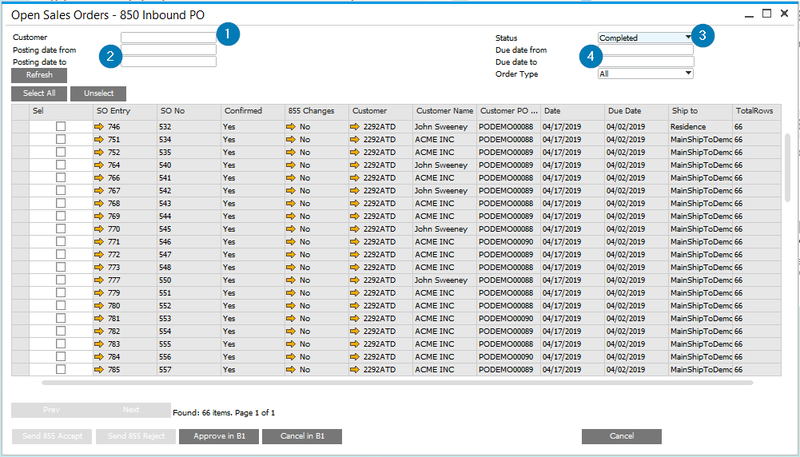 Not Complete – EDI Sales Orders loaded into SAP Business One that are not acknowledged or flagged for manual processing. Approved – EDI Sales Orders loaded into SAP Business One that are approved and acknowledged. Rejected – EDI Sales Orders loaded into SAP Business One that are rejected and acknowledged. Manual – EDI Sales Orders loaded into SAP Business One that are flagged for manual processing. Use this search field to filter by Due Date range. Start date of the Sales Order Due Date range filter. Use this search field to filter by Due Date range. End date of the Sales Order Due Date range filter. If checked, select the Sales Order for processing. Sales Order DocEntry number. Press the golden arrow to open the Sales Order details window. Press this button to process selected Sales Orders for creation of approved EDI Acknowledgement to Trading Partner. Note, the button will only be active when the status of the Sales Order is Not Complete. Press this button to process selected Sales Orders for creation of rejected Acknowledge to Business Partner (Customer). Note, the button will only be active when the status of the Sales Order is Not Complete. Press this button to manually process selected Sales Orders. No Acknowledgement will be sent. Note, the button will only be active when the status of the Sales Order is Not Complete. Press this button to exit the Open Sales Orders function.